Fighting with the 300 - Page 3 - DAMN Riders - No rules, Just ride! the hub spacer is a wear item too. same with wheel spacers and even the axle too although the axle will last a while. There is a lot to be said for the complete aftermarket kit that has the bearings, hub spacer, wheel spacers, bearing and seals (if applies) all in one. make sure to get the correct set for the axle size you have, if that don't fix it something is wrong with the hub or its the a hub off another bike. I would put my money on the hub spacer being too long or someone beat a bearing in wrong and it cant bottom out. 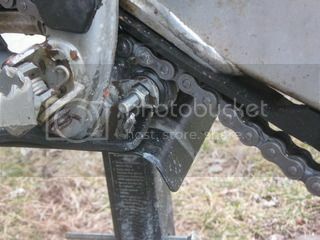 I wouldn't run it, if the sprocket is not lined up you can cause all kind of problems you don't need. Damage Inc. wrote: Step back and start over.. Completely disassemble all the wheel bearings look at the hub and make sure no trash got on to the seating area inside. I've seen where people have forced a bearing in and caused the aluminum to scrape off and deposit on the seat. If this has the inner sleeve/spacer, then build it without the hub. Take the axle bolt and feed it though the swing arm-spacer-bearing-center spacer-bearing-spacer. And see if it fits right. If so then somethings up with the hub. if not then something up with the bearings or the spacers or possibly the swing arm. How does the inside of the arm look and the caliper slide thingy. Not often but if it was run for a while with a loose wheel then they could be damaged. KTM didn't do somekindabullshit with selectable spacers did they? I'm going to order the upgrade kit and go from there. I did take everything apart,again, and it went together like it was supposed to. I even popped off the brake caliper to get a better look at things. I did a little grinder action to one spacer and used one of the original spacers, which really just looks like a fat washer. Tightened it down without a hitch, took a few measurements and everything lined up. Little test ride and all seemed well, so we said, "fuk it" and ran it hard for a couple hours today. It'll work for now and until the snow flies, then we'll put it in the garage and tear the whole bike down. My son and SIL thing it's "beastly" They can't keep the front tire on the ground. Got it tore down and back together. No issues with rear hub, still gonna get custom kit to put on. Two other things remain, kick start bolt broke off and ez out broke off in shaft It works. And is there supposed to be a lower chain roller? I added one (bolt was cut down after pic taken) where it looked like it was supposed to go. 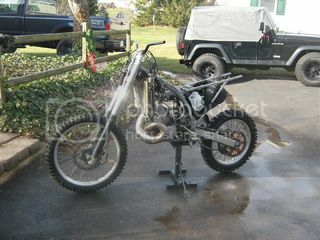 I don't think my '00 had one when I got it....The KTM parts list does shows one. The original was totally fried, worn through the bearing into the swingarm. That's why it was clunking. Yeah I did. Kinda made my own with sockets and large bolt/nuts etc. Worked like a charm. Actually went okay, but it's some work. I've done it on the bike before. It's a pain, but it works. Invest in the neoprene sock for the lower heim joint to cover it and that joint will last a long time. You could also cut up an old front tube and make a cover for it.